I’m reading a book, “Out of Poverty” by Paul Polak, that I have to write about before I even finish. If you only read the first chapter, your understanding of how to help people in extreme poverty will change forever. 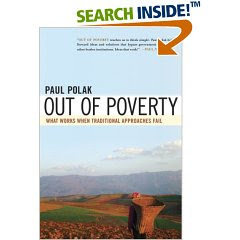 The book is “Out of Poverty” by Paul Polak, and he talks about people who live on less than $1 a day. Most are in remote places – Nepal, India, Zambia, for example -- with no access to markets or jobs. They scratch out a living on farms of less than an acre, and go hungry when monsoon or drought destroys their crops. Most people's first reaction when we learn of disaster or poverty is to want to send money or food. That’s the opposite of what Polak proposes. I don’t know anything about Ron Paul except that he said that such help taxes poor people in America to give money to rich bureaucrats in poor countries. Think about it. Jeffery Sachs has been preaching that we need to look at these remote areas of poverty and help farmers increase productivity of their farms, as does Polak. But the approach of such thinkers has always been to give those farmers improved hybrid seeds and fertilizer, or to fund the digging of wells, and such like. Polak has spent decades at the gemba of world poverty and has talked to poor families and walked their plots of land with them, listening to their understanding of their own problems. Large wells, more expensive seeds and fertilizer end up helping larger farmers, not those most in need of help. “Water lords” who own the land where wells have been dug will sell water to desperate small farmers at exorbitant prices. What Polak has learned is the simplicity of the lean approach, though he probably doesn’t know a word of the lean lingo. He’s listened to thousands of people explain what is keeping them poor. Yes, there are ways to bring new ideas, but they have to fit what the local family needs, and be something the local farmer can do himself or invest very small sums in. Polak respects these people as the ingenious and thrifty entrepreneurs that they really are. He learned from a farmer that he could irrigate a profitable vegetable field if he could utilize a very small source of water he had access to. He and the farmer came up with the idea of drip irrigation. What you’d have if you took your garden hose, punched little holes in it along its length and laid it next to your row of tomato plants. No large pumps. No sprayers losing significant moisture to evaporation before any water gets to the ground. No large well. No big expense. An investment, yes, but a small one. Later Polak learned to his chagrin that drip irrigation had been used in Israel for a long time. But their systems were too costly. So he started going to university engineering departments and small inventors and asking for creative ideas. And found them. The challenge was always to come up with a method of irrigation, moving crops to distant markets, pumping water from small wells, and so on. But the idea wasn’t to give these things to those in need. It was to keep designing and trying until you had something that could be manufactured at a profit to meet a price point poor people could afford. Does that sound like determining value to the customer and working out the means of manufacturing to achieve costs that allow profitability? Does it sound like right-sized equipment? Sometimes the new invention fails the customer it is intended for. The inventor learns at the gemba of the farmer’s field what the problem is, then goes back and improves the product. The other requirement is that systems be scalable. As the poor farmer accumulates a small fund of savings, he or she is more than willing to invest in his business. So if he can afford only to irrigate a quarter of an acre at first, he can afford to irrigate another quarter acre a couple of years after first achieving profitability. And scalable in the sense that the tools or equipment can be manufactured locally, and it’s something can be produced around the world in the millions. Why does Polak expect the manufacturer of the new product to profit? Because that creates work and prosperity for local people too. These are products that initially take minimal skill and minimum materials. Building little donkey carts, for example, if food can be produced but not transported to markets, by giving local people simple designs, attainable manufacturing skills and easy-to-find materials. Polak has a “don’t bother” rule, if his local customers and distant inventors and engineers can’t come up with a product that can help thousands. It it’s not viable in a large market, local entrepreneurs will have no reason to go into production and he can’t justify the time of expensive design teams with the know-how to do invent new products. Then local entrepreneurs won’t have the wherewithal to produce their own new products either. It still boils down to money, but very small sums of money. How do the formerly dollar-a-day people use their greater income? For new investment, but also for clothes and school fees so their children can be educate, or medicine when someone is sick, or a cellphone that can connect a isolated people with the rest of the world. It’s not too different from the method Mohammed Yunus developed for microlending. The two approaches can be used together. And guess what - there's an organization, not related to Polak's International Development Enterprises, called Engineers Without Borders. That should be enough for you to get the basic picture. It’s a book everybody should read. You should read it. Soon. Great post and good food for thought. Thanks for letting me know about that book... it's already on order! Many thanks for this. Very valuable. I will read the book. Thanks for the good post: some of my related previous posts: Appropriate Technology, Make the World Better and Water Pump Merry-go-Round.